*I Smell Sheep denies subjecting potential staff members to "Hunger Game"-like interview process. That would be baaaad. Fav thing to read: Urban Fantasy and Paranormal Romance; most happy when the two are combined. Eat: Salt. All the salt. A power you wish you had: Psychokinesis. For sure. I'm can be soooo lazy! Dream date: I'm not picky. If it involves whisky and food, I'm happy. If you could own a boat what would you name it and why: "The Drunken Scullery Maid" Judging by the amount of drinking and cleaning (sometimes drunken cleaning) I do, I swear I was one in a former life. First boy band you rocked out to: New Kids on the Block. At twelve I was convinced I was destined to be the future Mrs. Jonathan Rashleigh Knight! Boy, did I get that wrong. Well, Bianca, you and I would get along just great. LoL The Mr. is the whiskey drinking, I'm more of a wine drinker but as long as I have a glass of wine in my hand, everything is peachy. I'm not sure where you are from but if you ever make your way to central/upstate NY, be sure to get salt potatoes. I have a feeling you'd love them. They are lil mini potatoes that are boiled in obscene amounts of salt. While I was more of the BSB & NSYNC era, I did pull quite a few heads of my sister's NKOTB barbie dolls in my day. LoL Yeah, she's still pissed at me about that and brings it up at least once a year. I have not heard of these salt potatoes! They sound delightful 😊 I will keep this in mind for sure. I'm Canadian, but I've travelled the the States, just not that region. Miss Greenwood....I thoroughly enjoyed this! I love your reviews, you're definitely one of the best! Let's crack open a bottle and share our mutual love of UF/PR over a glass of whiskey or twelve! Hey, love the photo. Should be a book cover...unless it already is and I missed totally! We corn fed Midwesterners are sometimes a little slow on the uptake. It's probably all the Pepsi we drink here instead of....what is it called? Starts with a "C"... Oh well, nice to "meetcha!" Thank heavens someone else hasn't been swayed by the Coke fairies! Thank you! It's actually a selfie haha. But if anyone wants to make it a book cover, I'm game! 😬 Oh ladies! 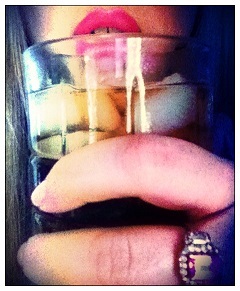 I'm a Coke girl 😕 Maybe I shouldn't confess that ... And a Diet Coke girl at that! Hi Bianca!I have a question, can you recommend any UF series that do not have cheating or love triangles? I'm so tired of finding a good first in series book, to have it ultimately filled with love triangles. I wish more authors could find ways for couples to stay interesting and exciting without having to add it. Any suggestions? Hi Piper! One series, if memory serves, that might fit the bill is Mimi Jean Pamfiloff's King Trillogy. A lot of series I've recently read are incomplete, so I can promise this pattern won't emerge. As of now, I don't think there are love triangles/cheating in Cynthia Eden's Blood and Moonlight books or Nina Mason's Knights of Avalon. I apologize if I'm wrong. I read so many books and this is definitely a common pattern I've become rather immune to!